Founded by winemaker Shane McManigle, who has since moved to Oregon, the project is owned by Emily Weissman and Stephan Schindler of Winemonger with Matt Duffy of Vinify taking over the winemaking. The grower is Mark Pasternak. The name Easkoot is that of Alfred Derby Easkoot, Marin County's first land surveyor. 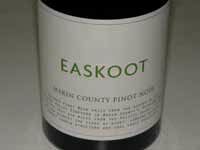 Eastkoot's first release will be the 2009 Marin County Pinot Noir (Corda Vineyard) and will be available through Winemonger.com.